Our world isn't free. All of us, for generations, have lived under the secret control of The Ancient Order of Romulus. One young woman, raised by them, trained by them, betrayed by them, must push through her fear to take a stand against the silent evil that masters our world. 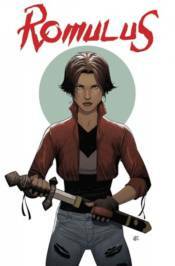 Her name is Ashlar, and her war begins with the brutal first chapter of the new Image series ROMULUS, from writer BRYAN HILL (POSTAL) and artist NELSON BLAKE II (MAGDELENA). Collects ROMULUS #1-4.